What a ride….What a nice ring too!! Some teams are like machinery that keep chugging along and others are like comets…not to be seen again. This 1998 Atlanta Falcon team was not a comet, however they did get in the way of one. Were they one of the best that didn’t win a Super Bowl? It’s debatable. The Falcons rode a workhorse in Jamaal Anderson and channeled a “win one for the Gipper” emotion after Dan Reeves open heart surgery, to make the most magical season happen in Falcon history. To go from 7-9 in 1997 to 14-2 in 98 was quite an accomplishment. In taking down the Minnesota Vikings 30-27 in overtime for the NFC Championship, they are seen as pulling off a monumental upset when if you look at the tale of the tape, maybe it wasn’t such a big upset after all. 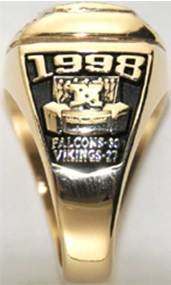 Upon further review, the 1998 NFC Championship pitted the best records EVER to meet for a conference title. The Minnesota Vikings at 15-1 were hosting the 14-2 Atlanta Falcons in the Metrodome. The combined 29-3 records was equaled in 2004 by the Patriots and Steelers. The Vikings were the sexier team since they broke the scoring record (556 pts. breaking Redskins record of 541) which included Randy Moss’ electrifying rookie season with 1300 yards and 17 TDs. Couple this with NFL Comeback Player of the Year in MVP Randall Cunningham. Add future Hall of Famer Cris Carter, HOF John Randle and Robert Griffith (All Pro Safety) wow…the Vikings were a meteor. Yet you have to understand where the spirit of the Atlanta Falcons came from. To do that let me welcome you to “The Second Chance Saloon”. All the principles of this football team were retreads that were unsuccessful at becoming a champion elsewhere yet combined with others in the same position, & melded into a tremendous fighting force. First you had Chris Chandler, a career journeyman who played for 5 teams before landing in Atlanta. Outside linebacker Cornelius Bennett, who had been a pro bowl player and perennial Super Bowl runner up with the Buffalo Bills, found new life in Atlanta once his tenure ended with the Bills. Wide receivers Tony Martin (66 rec. 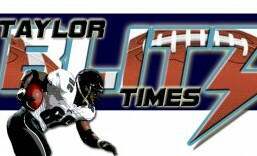 1,181 yds 6 tds) and Terrence Mathis (64 rec. 1,136 yds 11 tds) were castoffs of the Chargers and Jets respectively. Martin was the deep threat that scored the deciding touchdown in the Charger’s 94 AFC Championship win over Pittsburgh. Mathis was a serviceable 3rd receiver for the Jets who finally became a starter in Atlanta. Morten Anderson the Saints all time leading scorer. Ray Buchanon, the cornerback who had spearheaded the ’95 Colts run to the AFC Championship, he brought a spirited attitude along with Colt teammate CB Ashley Ambrose. Eugene Robinson the veteran safety had played in the last two Super Bowl seasons with Green Bay was a steadying force at FS. The casual football fan will remember Reeves as coach of the Denver Broncos for most of John Elway’s career. He had come from the Tom Landry coaching tree after his playing days with the Dallas Cowboys. After failing to win it all in 3 attempts with the Denver Broncos the team took a new direction in 1993. His former QB Coach then Offensive Co-ordinator was Mike Shanahan. The Falcons rode a bruising running game by Jamal Anderson, who had over 1,700 rushing yards that year, to bludgeon defenses. Chris Chandler played efficiently, new deep threat Tony Martin coupled with Clarence Mathis to form a complete offense. They were more steady than spectacular. As many sporting events and teams go…emotion and playing for a cause greater than themselves propelled them into the playoffs where they ran into Minnesota and one team HAD to lose. 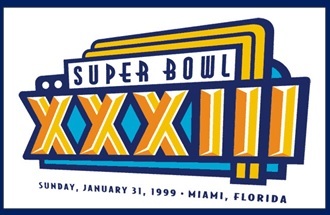 Two great stories approached the 1998 NFC Championship Game with the winner to take on the defending champion Denver Broncos, in Super Bowl XXXIII. One of the greatest NFC Championship games took place and an upset that may have kept a sexier matchup of high powered offenses from meeting in the Super Bowl but wasn’t as big an upset as others make it out to be. 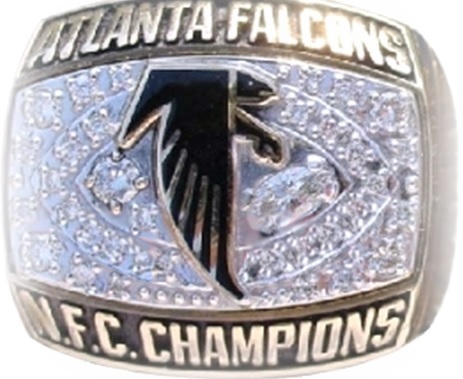 This entry was posted in Ring of Champions and tagged Ashley Ambrose, Atlanta Falcons, Chris Chandler, Chuck Smith, Conference Championship Rings, Corrnelius Bennett, Dan Reeves, Jamaal Anderson, Ray Buchanon, Super Bowl XXXIII, Terrence Mathis Tony Martin. Bookmark the permalink.